A few weeks ago, I was gearing up for a trip to Dallas. It was our first time flying with our toddler and I was stressed! How in the world was I going to get through security? How would I get on and off the plane, through the terminal, etc. all while carrying our bags? I had to take our departing fly without the help of my husband and I was stressed! My 21 month old likes to run free, but he also likes to be held at times. The thought of having my hands full (literally) with luggage while I worried about my toddler sounded daunting! 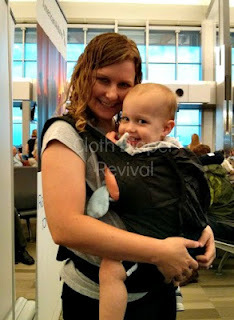 I loved the idea of bringing along my baby carrier and wearing him, but I didn't feel like I could pack one more thing. It's not the easiest thing to stuff in a bag because of all the space it takes up. So I looked for a new solution and found the Boba Air! I love that the Boba Air is lightweight and travels so easily! 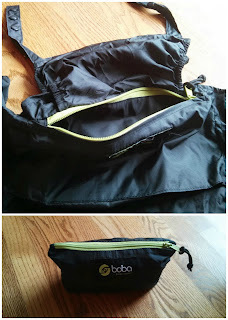 The fact that it can be folded up into a pouch all in one piece has to be my favorite part! Storing my baby carriers is one of my least favorite things because they don't fold up easily. This isn't a problem at all with the Boba Air! was contained in my carrier. The Boba Air is light weight and keeps me (and my toddler) from overheating, which is nice on a plane with no air condition and tons of people! I didn't find the fit to be as comfortable as my other carriers, particularly in the shoulders. The shoulder straps aren't padded. This is great for space saving, but not so great for wearing your child over extended periods of time. It is not so uncomfortable if you are only wearing the baby for short periods (walking from one airport gate to another, a quick grocery trip, etc.) I'm happy to add the Boba Air to my baby wearing collection! Enter for your chance to win a Boba Baby Carrier, a Boba Wrap or a Boba Air! All products can be seen at www.bobafamily.com. With Boba products it is easier than ever to enjoy Freedom Together as a family and Boba wants YOU to get a chance to use their products. To enter to win, “Like” them on Facebook (www.facebook.com/boba) and follow them on Twitter (www.twitter.com/boba). this looks excellent Jenny, I think my Hubs would love this because you know he is big and it looks comfy adjustable and easy to store!